The Segway Food Tour operates 3 times per day from April to October: 10.00, 14.00, 16.00. From November to March tours operate daily at 10.00 and 14.00. Lisbon can be very hot and crowded during the summer months. We are comparing Lisbon Food Tour by Segway Prices from leading ticket suppliers and Try to find you Cheap tickets prices on the market. Looking for a novel way to see the city of Lisbon? The Food tour by Segway certainly offers something different to the conventional walking tour. 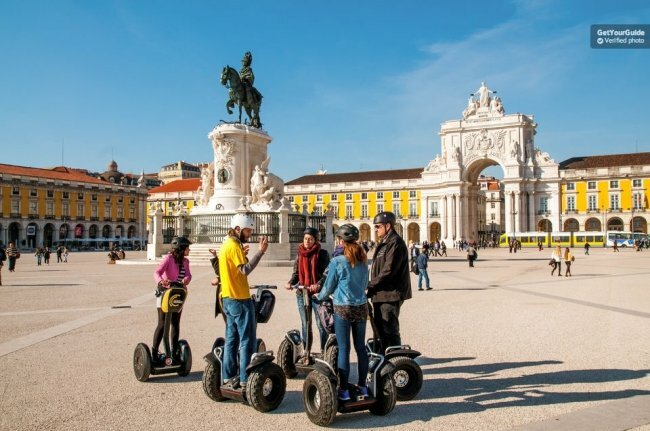 Standing on board a modern Segway you'll zip through the city, seeing a variety of places, let your guide lead you up and over the hills to the some of Lisbon's oldest neighbourhoods and listen as you hear the myths, legends and facts about this vibrant city. You'll stop to admire the gothic architecture of Santa Justa elevator, take in the façade of Lisbon's Cathedral, discover the popular Bairro Alto, and get to know the famous Alfama district. For foodies the highlight of this tour will be tasting some of Lisbon's local cuisine, savour a delicious ice cream on a hot summers day, sample some tasty pastries and choose from locally brewed beers or soft drinks. During the tour your local guide will be available to answer any questions and guide you through the city. If you're a foodie looking for a fun-filled ‘whistle stop' tour of Lisbon, covering both hidden sites and famous landmarks, then this is the tour for you. For first-time visitors or those with limited time in Lisbon the Segway food tour provides a comprehensive introduction to the city. This is suitable for individuals, families with children aged above 12, or small groups. Your Experience With Lisbon Food Tour by Segway? Discover the city of Lisbon in style, driving your very own Segway. Glide through the city centre and up to the historic district of Alfama. Visit lesser known neighbourhood in Lisbon with a local bilingual guide. Taste some Portuguese treats; ice cream, pastry and local beverages. What Lisbon Food Tour by Segway Includes? Use of Segway and helmet. Food tastings, drinks and snacks. The Segway food tour covers some of the same locations as the Lisbon bike tour, Alfama for example, so we recommend not taking both tours on the same vacation. If you're not confident driving a Segway then it is better to visit outside of the summer season, or take the 10 am or 4 pm tour, to avoid crowded streets. Book in advance during high season because the group size is limited to 5 participants. Travelers Reviews about Lisbon Food Tour by Segway? Lisbon's food tour by Segway has on overall 5 out of 5-star rating on trip advisor although it is still a relatively new tour. Positive comments mention the friendly guide and food tasting as highlights of the tour, also recommending the Segway tour as a fun way to see a lot of the city. Some participants indicate that the tour gives more of an overview of the city rather than in-depth tour. There is also a negative comment concerning safety aspects on busy streets, of course, accidents are possible while driving the Segway and the small group size minimises problems. Printed tickets or E-tickets will be accepted. All tickets are refundable up to a number days in advance of scheduled tour date. Viator will offer full refunds up to 7 days in advance and 50% 3 to 6 days in advance. This tour is available in English, French, Spanish, Portuguese, and German. Age and weight restrictions apply; all participants must be over the age of 12 and weigh a minimum of 40 kg and a maximum of 120 kg. There must be at least 2 participants per tour, if there are not enough participant the Segway food tour will be cancelled and tickets will be fully refunded. Legal drinking age in Portugal is 18. We recommend wearing comfortable clothing and flat shoes. Meeting Point: Rua dos Douradores, 16, Central Lisbon. Near Praca do Comercio Metro Station.